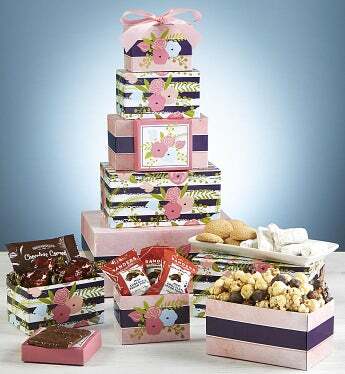 Celebrate Spring with this cheerful, floral Spring blossoms tower. Each beautiful box is filled with delicious treats including Flathaus® Cinnamon Straws, Harry & David® Chocolate Truffles, Brown & Haley® Chocolate Covered Grahams and more! Pretty dusty rose satin ribbon at the top. Celebrate Spring with this cheerful, floral Spring blossoms tower. Each beautiful box is filled with delicious treats including Flathaus® Cinnamon Straws, Harry & David® Chocolate Truffles, Brown & Haley® Chocolate Covered Grahams and more! Pretty dusty rose satin ribbon at the top to tie this cheerful gift together.